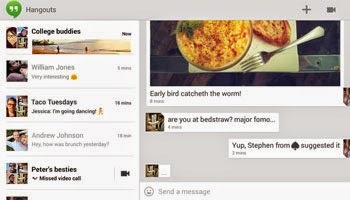 Android features a lot of apps that allow you to text for free. You can easily send free messages from your phone to your friends with the help of those text messaging apps. 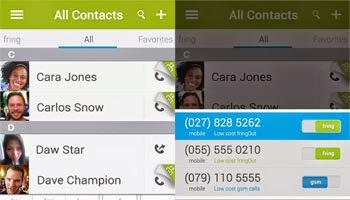 The apps also have additional features like free calling with or without video. This has reduced the number of calls and texts sent with the help of the network that the phone provides. However, one has to understand that these apps use internet as a medium of connection. You must be connected to an internet using WiFi or 3G/4G of your phone. The connection must be a good one if you want to smoothly perform video conversations or have high quality audio conversations. These apps also require the other party receiving your message to be a member. Method: In the Play Store we found a lot of apps that allowed exchanging of text messages, voice conversations and video communications. They were all listed by popularity and a list was generated. The list was sorted by the most downloads. For apps with equal number of downloads listed, ratings were chosen as a method of ranking and for those with equal ratings, the third criteria for ranking was the number of ratings. ICQ messenger has always been there for a long time. This popular tool is also doing well in Android devices. That is why this device is the 15th in our list of most popular Android apps. This app offers free text, calls, photo and video sharing. This is an app which is available for all mobile platforms including Android. So, get this app if you are interested in chatting with your ICQ friends. At number 14 is an Android application supporting free text and video calling. 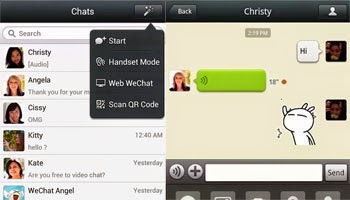 Allows you to connect with friends using fring across several platforms like Symbian. This app uses your phone number as your registration id so that it is easier to communicate. Group texting is a great feature in this and you can talk with upto 4 people at the same time. Our 13th most popular app is by Yahoo. Yahoo has been online for a long time now providing every type of web services available. They might not be the industry leader in many, but they do have some top services. Yahoo Messenger is one of them and it is not the same like it was in the year 2000 but still it is useful for many. Now Yahoo Messenger is a popular app in Android with free messaging, voice and video. SMS text messages are supported to certain countries. A simple layout and power features is what makes this app largely popular with millions of users. This popularity has landed this app on number 12. Send text to other textPlus members or make calls to them freely. Calls are of high quality if you do via WiFi or other high quality internet service provided by 3G or 4G networks. Other features like sending sms message to real phone numbers and making calls for a certain charge are some attractive features of this app. But we have discussed those features before in our free sms android apps post. Popular for its high quality video calls, ooVoo is a perfect app if you want to communicate with your friends with video online. This video calling app is our top 11 popular app in this list. Upto 12 people can be contacted in multi-stream video calls. For that you need a good connection to use the full power of ooVoo. 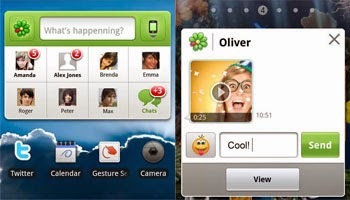 Instant messages to other ooVoo members is also a hit feature. 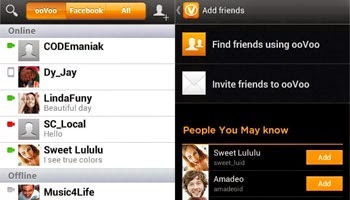 Your contact list and your friends from popular social networks can be search so that you can connect with those that already have ooVoo membership. Nimbuzz Messenger comes in at just top 10. The basic function of this app is to send unlimited text messages and share files across the internet. 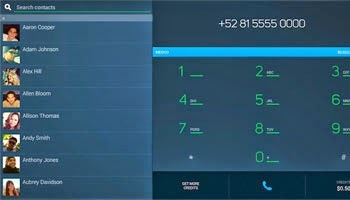 Available across almost all the platforms, this app also supports cheap international voice calls. This messenger also lets you integrate your other accounts and chat with friends at Facebook, Yahoo Messenger and Google Talk (Hangout). 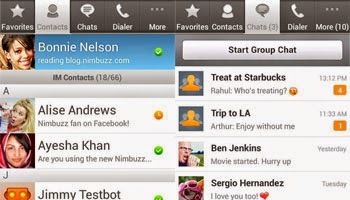 Group chats and chatrooms are other interesting features of Nimbuzz Messenger. Coming in at number 9 of our top 15 countdown, this is an app by Google. This app replaced Talk some months ago in mobile devices. This app gives user the ability to have all sorts of conversations with their friends. Supporting upto 10 people in a video call, unlimited texting and calling, this is a great app for connecting with your friends. Other attractive features are being able to share photos and emoji. WeChat is a high rated communication app coming in at number 8 in our list. With around 300 million members claimed this app offers video, text and voice calling. High quality of communication is a feature of this app. You also get to do group chats and there are animated smileys to help you express yourselves in a fun way. File sharing (photos and videos), walkie talkie mode (with upto 40 friends), contact importing etc are some nice features of WeChat. Coming in at number 7 in our list is another app that has voice, video and text messaging for free. Group chatting limit in this app is high with 50 friends. Additional features in this app include being able to play games with friends and family. These are mini mobile games and this app makes them multiplayer. Games also have leaderboards and scoring features. You will also be able to find new friends with the location aware sevice. 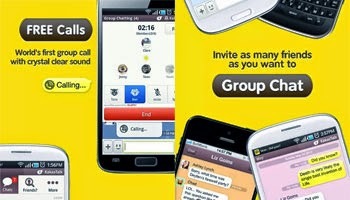 With an interesting name "KakaoTalk" this app is in our number 6. Group calls, chatrooms and messaging are some of the commendable features. The voice calls are also in HD making their quality crisp. Themes and emoticons are attarctive features of this app. This app is particularly famous in Korea and many Korean Pop artists can be made friend with this app. 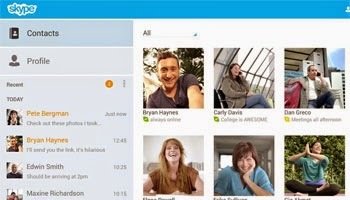 Skype is one of the first app that showed the world that VOIP works great. Skype might have even slowed down the use of telephony and text services by telecom companies. This app has a place in the top 5 most used Android apps for free texting and calling. Acquired by Microsoft, you have the option to use your hotmail/msn/live/bing (whatever you call it) account to sign into skype. The performance is great with free in-app calls and text message exchanging. Worldwide calling to phone numbers is also cheap with Skype. As we get nearer to the top of our list, we have applications that are more and more popular with users. In our number 4, with 210 million users across 231 countries according to the app description page, this app has seen some press coverages worldwide. 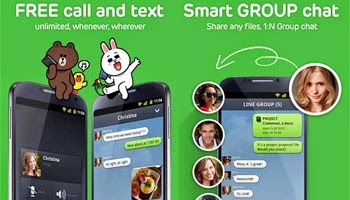 Line can be your social network with voice calls, messages and stickers. Messages are delivered instantly and you will be saving a lot on your calling and texting bills. Facebook is the number one social network with more than a billion members. Hence, it's messaging app on Android becomes automatically popular and is the top 3 most famous one. Almost all your friends are in Facebook and most of them are online even right now. Stay in touch with them using text, voice or video. 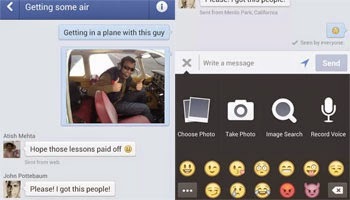 This app enables your Android handheld device to use the full potential of Facebook's communication service. 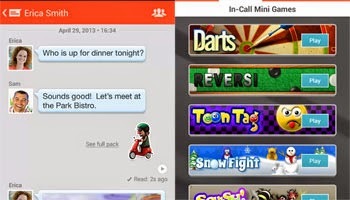 The app has additional features such as stickers, SMS integration and chat heads. Viber is a free app created to facilitate its members to communicate easily with each other. This app is number 2 in our list according to the criteria of downloads, rating and number of ratings. With a large user base who use their phone numbers as their id for this app, Viber has shown the world how free text messaging and phone calls are done. 40 is the number of paticipants in group communication. Sharing doodles, taking picture or sharing pictures from your gallery, sharing videos and locations are all within a few taps and slides on your phone. WhatsApp is the number 1 app on our list. This app is highly rated, widely downloaded and used all over the world. WhatsApp is a smartphone texting app with which you can send texts to your friends with WhatsApp account whenever you want to. Pictures, audio and video clips can also be sent to your friends. Group chats with your contacts is also possible. But it is not possible to call directly. 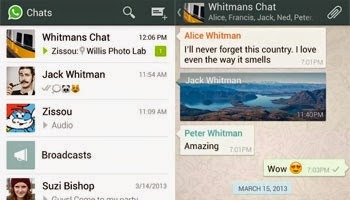 WhatsApp is also an app which is free for the first year and then from the next year it only costs 0.99 USD/year.